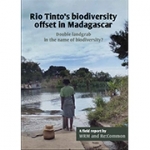 On the occasion of the Rio Tinto AGM on 14 April 2016 in London, Re:Common and the World Rainforest Movement, in collaboration with Collectif TANY are releasing the report Rio Tinto’s biodiversity offset in Madagascar. Double landgrab in the name of biodiversity? The report is based on a field investigation in September 2015. The biodiversity offset linked to the Rio Tinto QMM ilmenite mine in Madagascar has been widely advertised as a biodiversity offset model. However, the reality is very different from the picture presented in the glossy brochures distributed internationally. In particular, subsistence livelihoods of villagers at the biodiversity offset site of Bemangidy-Ivohibe are made even more precarious by the offset project. Communities that were struggling already before are now facing an increased risk of hunger and deprivation as a direct result of a biodiversity offset benefiting one of the world’s largest mining corporations. Rio Tinto claims that the ilmenite mine has come “at the rescue of the unique biodiversity of the littoral zone of Fort Dauphin”. This is despite the fact that a large portion of the 1,650 hectares of a rare littoral forest inside the mining concession will be destroyed during mining.